The Kiosco Morisco now sits in the Alameda de Santa Maria la Ribera in Mexico City. 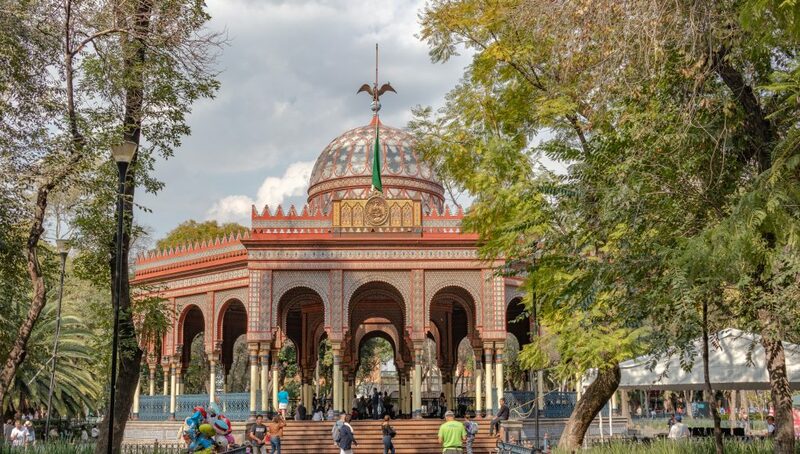 Although its appearance would make one think that it was originally designed and built by a North African country and gifted to Mexico, the Kiosco Morisco of Mexico City was actually designed by a Mexican engineer and built for an international exposition in New Orleans, held from 1884-1885. It’s even more remarkable to consider that the Mexicans designed the kiosco to represent Mexico in that international exposition in the U.S., instead of sending something that was more representative of Mexico. After the exposition in New Orleans, the kiosco was disassembled and moved to St. Louis for two years before it was returned to Mexico. Then the kiosco was reassembled in the Alameda Central in downtown Mexico City, where it sat for several more years before it was disassembled again and moved to its current location in the Alameda de Santa Maria la Ribera. Engineer José Ramón Ibarrola’s steel construction has proven extremely durable and, obviously, portable. 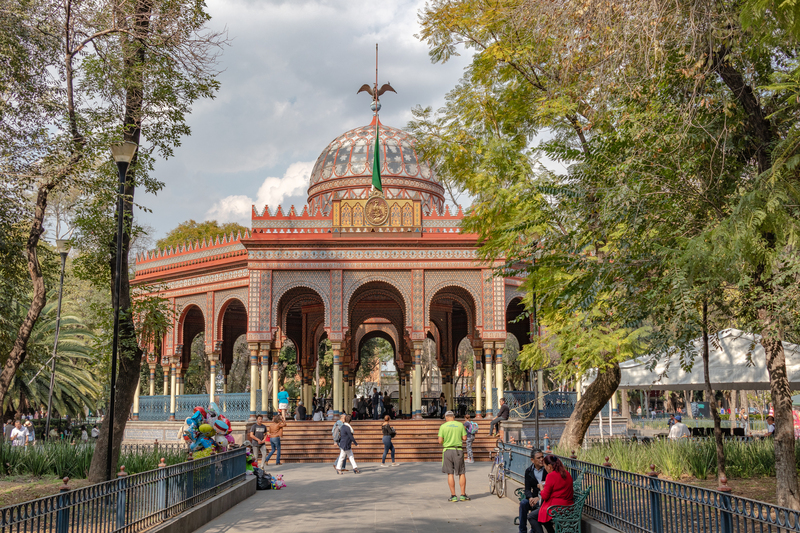 The Kiosco Morisco in Mexico City’s Santa Maria la Ribera neighborhood is a favorite spot for photographers, families, and tourists. Constructed entirely of steel and glass, the kiosco has been relocated several times and has been in the U.S. and Mexico. The Kiosco Morisco is beautiful from many different angles. This star pattern marks the very center of the wooden floor of the Kiosco Morisco. The glass and steel dome of the Kiosco Morisco in Mexico City. Previous articleDon’t hurt me. I’m fixed. Next articleThe falling rocks of Lubaantun.